James Wade and Michael van Gerwen continued to impress in Minehead as they reached the last 16 of the UK Open, while Mark Webster also progressed on Saturday afternoon. 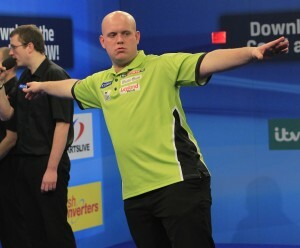 Two-time UK Open champion Wade produced an impressive display to defeat Belgium’s Kim Huybrechts 9-5. ‘The Machine’ was then pitted against Terry Jenkins in the draw for the fifth round, which will take place on Saturday evening. Tournament favourite van Gerwen averaged 100 to claim a 9-5 win against Andy Hamilton, setting up a last 16 clash with Webster after the Welshman edged out Paul Hogan in dramatic fashion, winning a last-leg decider. Robert Thornton, Paul Nicholson and Vincent van der Voort all bowed out on Saturday afternoon, however, suffering defeats against Mensur Suljovic, Jenkins and Christian Kist respectively.